Posted on April 12, 2012	by Derek "Gamer Crash"
Out of all the games on the show floor, Max Payne 3 and Borderlands 2 were the big ones in everyone’s book. You got there as early as possible to stand in one of the two long lines. While I didn’t get in on Borderlands 2, I did manage to secure time with our old buddy Max Payne to see how Rockstar was preparing to bring back the pill popping, alcoholic former police detective. So does Rockstar have another smash hit on their hands? After waiting a good while in line, I was ushered in by a developer who gave me the run down on what Rockstar has been up to in addition to some critical gameplay elements. The environment in the booth was fantastic and very personable. There was also a DJ spinning tunes giving it a party vibe in there. It was cool to get some one on one time with a Rockstar dev, though it put a ton of pressure on me to play the game well and not look like a jackass. The level I got to play was early in the game as Max is still in New York (and has all of his hair). You’re fighting your way through a bar with your partner taking out thugs along the way. One thing I was warned about was the health meter. As you take damage, it rises until you enter a “Last Stand” mode where bullet time takes over and at this point the next bullet could determine a quick death or a second chance to live. Naturally, the action took my breath away and blissfully distracted me like a moth to a flame. Without realizing it, I was quickly put into last stand mode. Thankfully, I managed to fire off a bullet and take the guy out before he got me. At this point, I quickly popped a pill to reduce my damage back to normal levels. At this point I told myself it take advantage of the cover system Rockstar is adding into the title. it’s a welcomed addition but one that won’t be the focus of the game like it is in a game like Gears of War. Yes, it’s handy to use in a tight spot, but Bullet Time, Shoot dodging, and all of Max’s abilities are what you’re going to want to use. It all feels natural and will become instantly familiar to fans of the series. Presentation is once again a major focus as you have the noir style cutscenes with multiple panels detailing the action. Another sweet aspect? No load screens. Instead you’re treated to those wonderfully crafted cutscenes which serve to mask the loading aspect. Max is sporting a wonderful visual style giving it a gritty look to it, fitting the source material very well. Last kills also give players a very cinematic view of the bullet firing from your gun until it reaches the enemies fleshy parts. It’s very cool. One other aspect that caught my attention is the amazing animations and realistic AI behavior. Using the Euphoria engine, Rockstar has managed to add a sense of reality to gun battles. At one point I hit a guy in the arm and though he was down but not out, the enemy held his arm while shooting at me. Reactions to getting hit with a bullet are also very impressive with enemies behaving as you’d imagine they should based on where they’re hit. It’s this type of realistic AI injury behavior that adds another layer to an already impressive game. I know they used this system in Red Dead Redemption but something about seeing it in play here seems to suggest that they took this system to another level. While I may have waited an hour in line, the short single player section I got to play was well worth the wait. The demo lasted about 10 minutes but it only seemed like I played for less than 5 minutes. The strongest feeling I got after playing was one of sadness that I now had to wait a month and a half to get my hands on it. 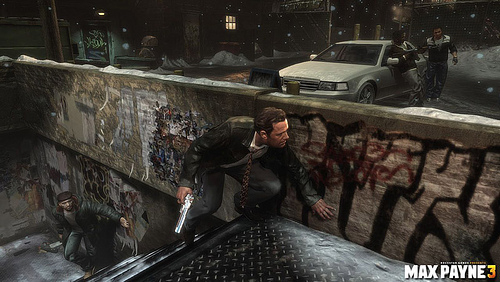 Rockstar is positioned to strike gold once more when Max Payne 3 hits in May. This entry was posted in PAX East 12, Preview and tagged PC, previews, PS3, Xbox. Bookmark the permalink.